Three aging siblings return to their childhood home when their father suffers a stroke. 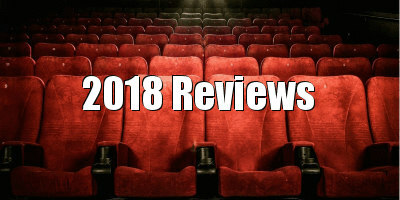 The theme of characters finding a renewed outlook on a stagnating life upon making a reluctant return to their childhood home is something of a filmic cliche, particularly in American indie cinema, with every other movie that premieres at Sundance seeming to follow the format to some degree. What makes Robert Guediguian's very Gallic take on the concept stand out is that his protagonists are all in their sixties, and so it's not so much about setting them on a new path, but rather having them accept the path they've trodden, and whose end is beginning to approach. When their elderly father Maurice (Fred Ulysse) suffers a stroke, rendering him close to a vegetative state, siblings Angele (Ariana Ascaride), Armand (Gerard Meylan) and Joseph (Jean-Pierre Darroussin) reunite at their childhood home in a small town on the mediterranean coast. It's a site haunted by a tragic memory, as Angele relives the death of her young daughter, who drowned when left unattended during a past trip. But there are also happier memories for Angele, a popular stage actress, in the form of handsome young fisherman Benjamin (Robinson Stevenin), with whom she once enjoyed a brief fling. In love with both Angele the woman and Angele the artist, Benjamin fancies himself a performer, reciting dramatic texts in his home after a long day's trawling, and hopes the object of his affection will stick around. Joseph arrives with Berangere (Anais Demoustier), his former student now soon to be ex-girlfriend, in tow. He's also just lost his job as a professor in ambiguous circumstances, but there's enough in Joseph's abrasive personality to suggest multiple reasons for his dismissal. Moaning about Arabs and Jews while rushing to the aid of a group of child migrants who wash up on the shore, he's a contradictory soul, lecturing those around him about workers' rights while behaving like a classic middle class snob. Armand is a relatively closed book who throws himself into practical tasks, reopening the family's cafe and clearing the nearby fields of weeds. He's often seen observing his siblings from a distance, in silence, like an Apache on a hill watching the white men in the valley below, aware that disruption to his simple life isn't far away. On paper, not a lot happens in Guediguian's film. It's composed of quiet moments, assembled carefully like a thousand piece jigsaw, of which 800 pieces are of the blue sea that provides the film its backdrop, lapping waves adding a soothing score to many scenes. We learn about its characters not through grandstanding monologues, but rather through unspoken moments and silent reactions, Guediguian often refusing to follow his protagonists down the paths they choose, instead turning back to see how things are at the ranch. This ambiguity and concealment adds a layer of verisimilitude, as if we ourselves are staying with these people, but aren't following them around like stalkers. All three of the central actors have experience working together, often in previous films of the director, and there's a wonderful moment in which Guediguian presents us with a flashback to their youth, recycling footage from his 1986 film Ki Lo Sa?, which happened to feature all three actors in a similar seaside locale. It's a cheap trick, but undeniably effective, and seeing how time has chiseled away at their handsome features like a drunken sculptor (in the case of the men; Ascaride has barely aged, privy to that secret of eternal youth French actresses refuse to share with the rest of us) will have you questioning your own mortality. 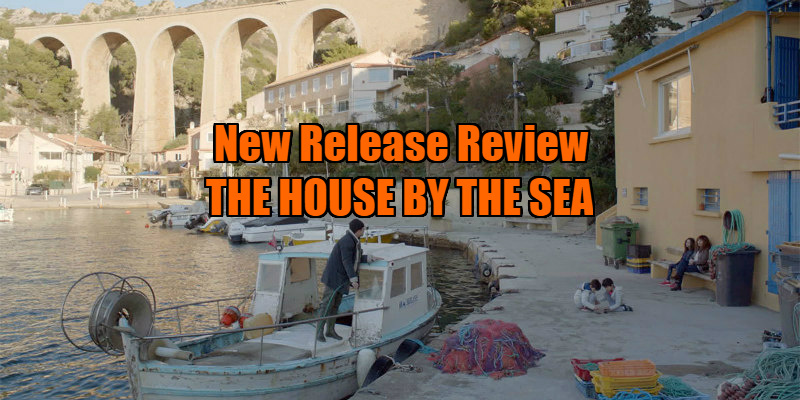 If you didn't know better, you might begin to think The House by the Sea was a late chapter in some ongoing series like Richard Linklater's Before... films. Guediguian fashions a feeling that these are characters we've met before, but never really gotten to know until this moment in time. By its climax, we still don't really know a huge amount about his film's protagonists, but we've seen enough to wish them well, whatever path they may take. 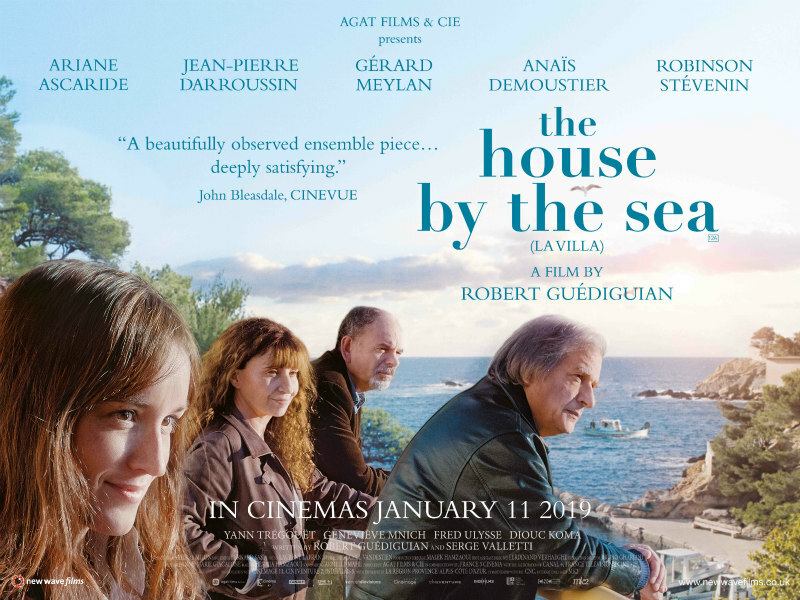 The House by the Sea is in UK cinemas January 11th, 2019.